Funny story. Remember that new Mini JCW Motoring File talked about a few days back. Well, they were completely unwrong about that. It's the new Mini John Cooper Works R56 — a tuning kit for the MINI Cooper S's twin-scroll 1.6-liter four — and it's debuting next week in Geneva. The mild tuning kit can be installed on any new-model Cooper S, providing around 17 more horsepower and 10 more lb-ft of torque. An overboost function can increase torque temporarily to nearly 200 lb-ft, from 184 lb-ft. No word on US price yet, but it'll cost 1,689 in Germany. There's also no word on the rumored high-po Mini JCW reportedly in the works. Get the Racing Feeling: John the Cooper Works Tuning kit for the new MINI Cooper S.
The International Automobile Salon in Geneva (March 8th - 18th 2007) is the setting for the world premiere of the John Cooper Works Tuning Kit for the MINI Cooper S. From mid-2007, what is already the most powerful version of the compact premium model will be given an additional power boost under its bonnet. With the John Cooper Works Tuning Kit for the MINI Cooper S, the output of the 1.6 litre twin scroll turbo engine is increased to an impressive 141 kW/192 bhp, with maximum torque up to 250 Newton metres in the engine speed range between 1,750 and 5,000 rpm. With the overboost function, the torque level can even be increased temporarily to 270 Nm for powerful acceleration in the engine speed range from 1,750 to 4,500 rpm. And the MINI brand has even more John Cooper Works components on offer for fans of the new MINI Cooper S - enough to quicken the pulse and put motor racing passion into everyday driving. These include a sports chassis, perforated brake discs for the front axle of the MINI Cooper S and 18-inch light alloy wheels. These options can be ideally combined with numerous other features from the John Cooper Works accessory range which equally enhance the car's sporting spirit: with the aerodynamics packages in body colour, the John Cooper Works sports seats, the John Cooper Works sports steering wheel and selected equipment components made of carbon-fibre-reinforced plastic. Not only is the dynamic potential of the new MINI Cooper S increased but also its charismatic sporty appeal. Racing expertise for more fun in everyday driving. The John Cooper Works Tuning Kit for the MINI Cooper S includes components whose development is derived directly from expertise gained from motor racing. This most powerful version of the new MINI thus carries on a tradition which dates back to the legendary racing success of MINI and John Cooper Works in the sixties. The John Cooper Works Tuning Kit for the MINI Cooper S consists of a sports exhaust system, a sports air filter and an electronic engine management system optimised for greater power efficiency. The resulting package fires the MINI Cooper S to new performance peaks and even greater driving fun. Perfect look for a sports vehicle. And the sporty look of the new MINI Cooper S can be further refined with the appropriate ingredients from the John Cooper Works collection. The sports suspension not only ensures even more agile handling but also lowers the suspension by 10 millimetres. In keeping with this, John Cooper Works provides an aerodynamic body kit in body colour - consisting of a front and rear apron and side sills - as well as several versions of 18-inch light allow wheels. The "Double Spoke" design has a particularly agile look and is new for 2007. The largest wheel authorised for the new MINI (dimensions 7J x 18) has low-section tyres sized 205/40/18 with runflat properties. The perforated brake discs are also borrowed from classic racing technology. And finally, numerous equipment components in carbon-fibre-reinforced plastic give the MINI a new visual kick. The high-tech Formula 1 material is used for John Cooper Works trim panels for the front air inlet, exterior mirrors and tailgate handle - not made exclusively for the MINI Cooper S but also available for other model variations of the new MINI generation. The new MINI: individuality is the key focus. 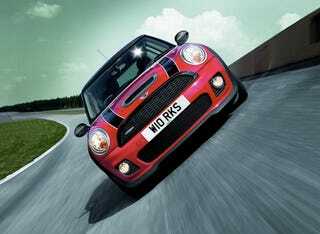 A John Cooper Works roof spoiler with carbon spoiler is also available for the new MINI. John Cooper Works leaves its mark in the interior of this racy little car, too: the John Cooper sports seat (ED: not available for the US market) provides an attractive appearance and optimised lateral holding for dynamic travel. And if you want to be absolutely sure of having a good grip on the new MINI at all times, you will opt for the John Cooper Works sports steering wheel. It is optionally available with a cover in leather or Alcantara - a stylish touch of individual flair! Alternatively, the Original MINI accessory range offers a single-section roof spoiler which can be finished in body colour. Even greater individuality is provided by additional headlamps, illuminated entry sills with free choice of lettering and a wide range of roof decor variations. In addition to the popular motives "Union Jack" and "Chequered Flag" - which are also available for the mirror covers and door handle trim elements - the roof of the MINI can also be decorated with the MINI lettering or even the markings for a helicopter landing spot ("Heliport" motif). The Original MINI accessory programme also offers MINI fans the opportunity to increase the comfort and functionality of their vehicle. The MINI interface for integration of Apple iPod models means you have just the music selection you want as you drive. MINI-specific roof and rear carrier systems enable the safe transport of bicycles, skis, snowboards or roof boxes. The especially useful options also include high-quality textile floor mats, a rear protective cover, a luggage compartment tub and folding sun blinds. No matter whether sporty or practical: thanks to the extraordinary variety of the individualisation options available, every MINI is one thing above all else: unique. Give Me One With the Works: Mini Planning JCW "Stage One Kit"